Is the DIY Drone Movement About to Launch a Billion-Dollar Industry? Back in the 1970s, hobbyists like Apple cofounder Steve Wozniak built homebrew computers that eventually fueled the lucrative PC revolution. Now, a new movement of hobbyists is trying to imitate this DIY strategy to jumpstart the drone industry. But can today's calculated drone entrepreneurialism really be considered "DIY" at all? Chris Anderson has a hobby. Well, Chris Anderson had a hobby. The former Wired editor started getting interested in the DIY nature of drones back in 2007. Before he knew it, the London native had resigned from the magazine "to spend more time with his robots." Now, Chris Anderson has an enterprise: 3D Robotics. You could call him the Steve Jobs of drones, but you wouldn't. Unlike Jobs, Anderson didn't stumble on a homebrew tech movement and figure out how to market its products. He's marketing the DIY movement itself. Drones — that is, unmanned aerial vehicles (UAVs) for civilian use — are the perfect DIY tech for the 2010s. A decade of rapid innovation in the smartphone market has yielded a whole host of low-priced sensors that make it possible for anyone to fly robots with little to no experience. Accelerometers, gyroscopes, wireless antennas, autopilot systems, cameras, and processors that once cost hundreds of dollars a piece, can now be bundled into a basketball-sized aircraft and controlled from a smartphone. 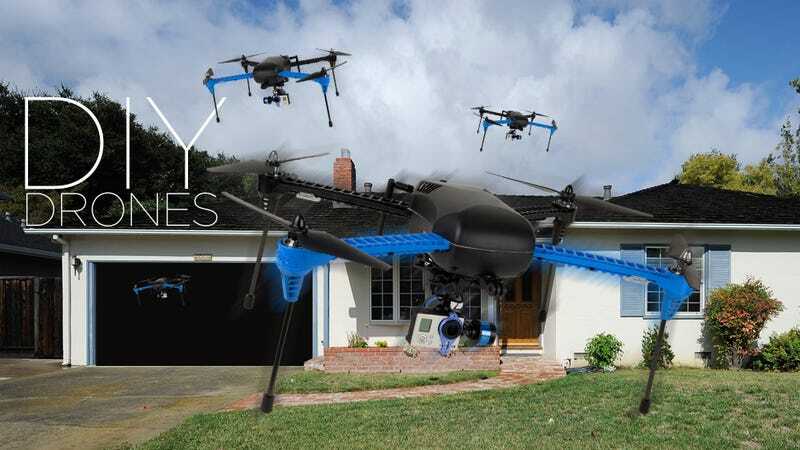 It's so cheap and easy that people are building drones in their garages. "This is a classic grassroots, bottom-up approach," Anderson told Gizmodo in a recent interview. "The pace of innovation on the grassroots is so much faster." The DIY community loves this idea. What doesn't sound awesome about building a flying robot cobbled together from cheap electronics? In recent years, however, profit-hungry corporations have also learned to love this idea. Straddling both sides, Anderson's 3D Robotics is trying to turn a hobbyist fascination into a multimillion dollar business. But the outcome will hardly be DIY. The state of the recreational drone industry is at a crossroads. The hobby originally grew out of the DIY-friendly remote control aircraft community in the 2000s, when Anderson first became involved. Six years ago, Anderson even started a website called DIY Drones for fellow hobbyists to trade hardware tricks and software tips in forums. An engaging forum is key to any real DIY community, after all. To understand where the drone industry is today, just look back to the Homebrew Computer Club in Silicon Valley circa 1975. This community launched the personal computer revolution. In bi-weekly meetings, members of the Homebrew Computer Club helped to develop the world's first PC, and they eventually established some of world's most successful computer companies. This is the forum that inspired Steve Jobs and Steve Wozniak to build the first Apple computer in 1976. The Homebrew Computer Club is also the where one of the original software pirate scandals happened, after a young Bill Gates scolded the members for pirating copies of his BASIC software for the Altair 8800. But before Apple became one of the richest and most powerful corporations in the world, it had to shake those DIY roots. The original Apple I was a computer kit, and Jobs quickly realized that people didn't want to build their own computers. They wanted to take them out of the box, plug them in, and turn them on. BYTE Magazine called this idea an "appliance computer" and dubbed the Apple II the world's first in 1977. Computer hobbysist could still tinker with the set up quite a bit, but by the time Apple released the Macintosh in 1984, it was clear that the personal computer of the future was going to come preassembled from a factory. It was quite the revolution, the series of events that took computer-building garages to giant factories. Anderson said so himself. "There had been computers before the Homebrew Computer Club," he said. "But it was a grassroots, hacker community that did it." This doesn't mean that the hacker-tastic Homebrew Computer Club typecast went away entirely once you could buy the the machines at Circuit City. Plenty of people still build their own computers from scratch! However, few people would describe computers as a DIY fascination these days. Imagine ordering an iPhone kit. It feels like Anderson is trying to lead a similar pivot in the DIY drone community. He left Wired to run his new company, 3D Robotics, around the time that affordable, ready-built drones were starting to hit the market. The tipping point has happened. "It's very much like the Homebrew Computing Club. For them it was the chip—the Intel 8080 [that powered the Altair 8800]," Anderson explained. "For us it's the series of sensors." This is result of that decade of rapid innovation mentioned above. "Basically a formerly unobtanium technology became available to everybody," Anderson added. "A single gyroscope sensor cost $10k and was the size of a lunchbox a decade ago. Now, you can get nine sensors on a chip the size of your thumbnail for $7." 3D Robotics sells its flagship drone, the Iris+, for $750.00. That comes with a quadcopter, a battery, a charger, a radio controller, and four tall legs. The kit's billed as "ready to fly," but in reality, it's not so simple. If you want to connect a camera, you'll probably want a gimbal ($210) and you'll definitely want a GoPro ($400) with SD Card ($20). A radio set so that your smartphone or computer can communicate with the drone mid-flight is a good idea ($100), as is an extra set of propellors ($20). Buying all of the parts separately and installing them does feel pretty DIY. It also feels expensive. A full-featured Iris+ with all of the above accesories actually costs $1,500. Think of the 3D Robotics Iris+ as the Google Nexus of drones. Because actually, the hardware is just one way for 3D Robotics to distribute APM Copter—a free, open source autopilot software platform and a sort of Android equivalent for drones—that it hopes will become an industry standard. The Iris+ is just one way to experience the APM ecosystem. It's all dripping with that all-American homebrew feel, when in reality all of the parts are manufactured abroad thanks to tens of millions of dollars worth of venture capital funds. The latest investor in the company is none other than Richard Branson. There's nothing wrong with any of this. Lots of hobbyists are undoubtedly downloading 3DR's open source software, and plenty are surely buying sensors from the company's store. However, it's interesting to see how Anderson and company are putting a premium on the grassroots origins of 3D Robotics and DIY Drones. Just as a point of comparison, let's use the Android versus iOS analogy. If the Iris+ is the Nexus of ready-to-fly drones, that would surely make DJI's wildly popular Phantom the iPhone. This is the drone your grandma could fly. The basic Phantom 1 costs less than $500, while the camera-equipped Phantom 2 Vision will set you back $900 (with a free extra battery). The now familiar white quadcopter connects seamlessly with a smartphone and streams live footage from the air—no extra hardware necessary. It's not as versatile or autonomous as the Iris+, but not everybody's looking for that. This seems a little bit backwards, doesn't it? Why should the easier-to-operate product with more features out of the box cost half as much as the seemingly more basic and difficult-to-operate product? Marketing, that's why. The extent to which Anderson and 3DR are leaning on the tradition of homebrew computing and grassroots engineering is hardly surprising. Drones in the 21st century are a lot like computers were in the 1970s! That's a great thing that's lead to all kinds of innovation. However, it almost seems like 3DR is putting a premium on the DIY nature of its products—as if some "Engineered in a Garage" sticker would justify an extra couple hundred bucks on the price tag. You could even compare it to the wildly popular craft beer industry. Sure it's twice as much as Pabst, but it's craft beer. It might be hard to swallow, but you'll get used to it. But you know what? So what. The market for drones is pretty uncertain at present, as the Federal Aviation Administration (FAA) continues to struggle with drafting regulations for the small commercial unmanned aircraft. Those rules probably won't be ready until 2017, and it's a little unclear what the implications will be for hobbyists. There's a nasty rumor that the FAA will require commercial drone operators to have a pilot's license to fly. Meanwhile, the market for DIY kinds of technology remains huge. Companies like littleBits and MakerBot have found great success doing all things DIY. Meanwhile, franchises like MakerFaire have become a whole new kind of hacker club. Innovation is all over the place, and as components continue to get cheaper, more people will surely sign up to become makers themselves. It's a big business! So as appealing as buzzwords like "grassroots" and "DIY" and "hacker" and "homebrew" sound, it's important to remember that the companies capitalizing on those brands aren't just operating out of garages any more. And just because something offers flexibility, doesn't mean it's the best deal for you—especially in the burgeoning hobby drone industry. In that context the Android-iOS analogy doesn't quite work for the Iris+ and the Phantom. It's more like the Apple I and the Macintosh. If you want to put together a kit, an Iris+ is perfect for you. Want to learn to drone in five minutes or less. Go for the Phantom. Just don't fly it anywhere near the White House.